Regarding the orange and tan labels . I have seen Young Americans ( this catalog number) and also Aladdin Sane with a tan label on side one and an orange label on side 2. Anyone know anything about this ? I have gone through the US releases on both and see nothing about having both colors labels on 1 LP. "Credits and lyrics are custom printed on the inner sleeve." The images for this entry show the credits on the back of the jacket. My copy of the inner sleeve has lyrics on both sides, though here there is no image of the inner sleeve's 2nd side. The record labels/cover spine/inner sleeve all give the presumably correct catalog number DB 74765. But the outer sleeve lower left back has DB 74764 on my copy. This pressing sounds great. Dead quiet between songs, and good sound separation. Just came in today. Wow. One of the best sounding records I own. "Win" is otherworldly. This is THE ONE. The sound is terrific. It stands out on my itunes music every time in terms of quality and wearing headphones, you really get a surround experience, even from the CD - that is not to mention the high top quality dvd cuts! I have feeling that high range missing. Sounds good, but you must open treble. Thats like my wife cooks. Always missing salt. 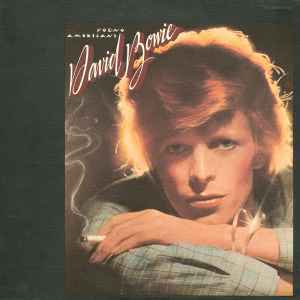 Another winner in the Parlophone resisues of Bowie's back catalog. The mastering on this is just wonderfully detailed and rich. And the packaging mimics the original even down to the textured cover and Bowie promo insert. Highly recommended. The sound quality on this album is great especially on the track "Win"